This was my 4th training experience at MVT but my first Force on Force. In my opinion is this is the most valuable course MVT offers. I’m not going to go super in-depth with a “we did this, we did that” AAR – I know others will do that better than I. Rather, some takeaways for those who weren’t there but are thinking about tactical training. FOF is open to anyone – no MVT prerequisites such as with Combat Patrol. That said, you really need to have some basic rifle skills down to get the most from the training. 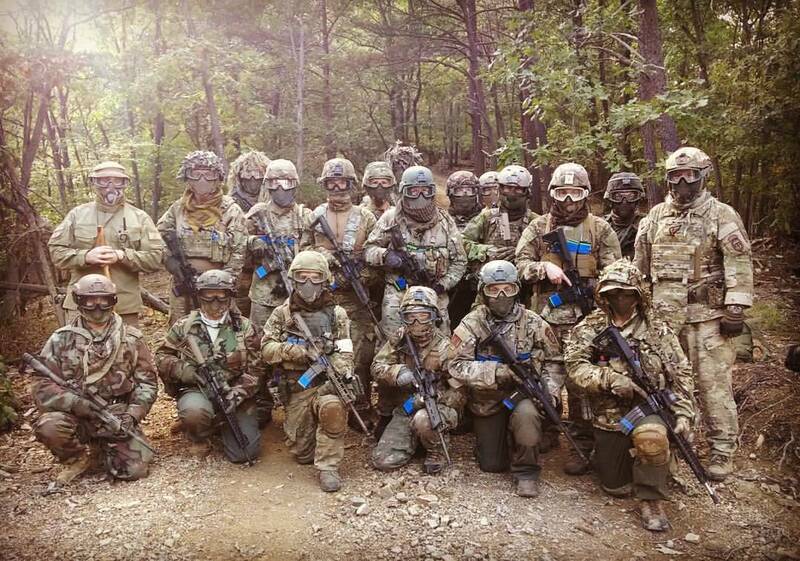 For folks that have never done CTT or such, this is a great first class because you will be indoctrinated into team tactics/fire and movement throughout the weekend. We had a few participants in this camp who attended and fell right in with the basic fire and movement of our teams. Can you perform better with a CTT under your belt, of course. But IMO starting with FOF gives you more context (people shooting at you + speed of engagement and movement) to learn the team movements at CTT. You’ll get off the X faster, that’s for damn sure! Incredible facility that combines challenging and varied terrain from valleys to steep inclines and meadows to bunkers and CQB buildings. These elements add a difficulty factor which is invaluable towards building a skill set that can help survive a real conflict regardless of your AO. PT comes into play here as it should. The UTM technology is seamless with your existing AR with a simple bolt change being all that’s necessary. The rounds are pricey for sure. But the training value of being able to employ your personal weapon system against an opposition that isn’t tacked to a target stand is priceless. Do they hurt? Enough to let you know you’re hit, no more in my opinion. At first I thought the UTM effective range of <50 yards was a training limitation. In open terrain, for sure. But in the woods or around buildings, it made it harder to “kill” your opponents making movement and angles that much more important. Less is more in this case. When you attend square range training, the other attendees aren’t an asset – they’re usually in the way of you getting more attention from the instructor. At FOF, the participants are obviously necessary but they are also an incredible asset to the training. You’ll have a mix of experience for sure and in our case the teams were pretty well evenly matched. You’ll learn from teammates who have more experience and you’ll have the chance to help others along too. FOF is so different from an instructional standpoint when compared to CTT or CP. Instead of spending the time (necessary, yes) drinking from the informational firehose, you’re spending almost all of it on actual scenarios (I think 10-12 over the weekend?) with an instructional debrief after each. There is a unique thing about knowing there are other guys (and girls) headed your way with the intent to “kill” you. Learning seems to happen much more organically. To their credit – the instructors, both Max and First Sgt put the pressure on the students to choose leadership, make tactical decisions and command the battles. This light instructional hand paid great training dividends. But the biggest difference between FOF and all other classes – square range and Max’s included – it that your rifle skills, gear, personal fitness, ability to problem solve (OODA), communicate and general grit will be tested and developed more legitimately while under UTM fire than any other method of training short of the real thing. The lanes at CTT push you but the unlimited variables of FOF take it to another level. Be willing to follow as much, if not more so, as leading. If someone else is leading, be the end of the hammer – let them swing it. Goggles you pretest for fogging/condensation. Go stand in a hot shower with them or something. Bring anti-fog wipes. Remove the thin layer of foam around the frame to let them breathe better. If it’s uber hot (as it was for us) wear an absorbent head wrap under your helmet. I cut a strip from a camp towel and it worked. This will help keep the sweat from running down your forehead and across the inside of your lenses. Seriously. If you can’t see you aren’t any use in a fight. Bring lots of water but you don’t need to camelback it on you – drink between runs, it saves weight. Mesh face shield. Ask Wang why. Being good at anything requires commitment and sacrifice. I can think of no other purpose more worthy of these things than preservation of life and liberty. After all, responsibility is the price of freedom. Sadly, most people only pay lipservice to the concept of freedom and liberty. Not the people I had the privilege of working with this weekend. They put a holiday weekend on hold, many driving from several states away in order to make a deposit on this commitment. Despite differences in age, fitness and experience, everyone put out 100%. The instructors put their holiday on hold too – don’t take that for granted or the availability of type of training. It’s more unique than you know. Lastly, doing FOF in particular settles any lingering doubt as to whether an untrained group could survive against a mildly organized opponent. No damn way. Which is why I will be back for more training – next time with friends.